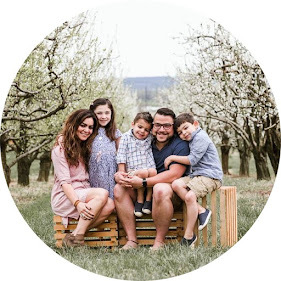 Not long before David was born, a Trovato Vacation was booked to the Finger Lakes, New York for the beginning of August. At first Matt and I scoffed at such a vacation so close to a due date... and then when his due date came and his due date went we decided we would opt out and stay at home. But then he was born, that little easy-going baby. And we decided that you know what? Two wasn't so bad. We could handle two. So we changed our minds and became a last minute addition to the Trovato Travelers. David was only three weeks old at the time. We all stayed at the tip of Seneca Lake at the Ramada in Geneva. All eleven of us. We did a lot of wine tasting while the grandparents watched the kids....and possibly drove us around. We ate hours long dinners in the hotel, which as you can imagine with the toddler were not a favorite of hers. We drove to Niagara Falls and took in those few sites. David wasn't even a month old and he was traveling internationally. Jet setter that one. We went hiking. Lots of hiking with lots of steps and a bjorn and a backpack. Who says children will slow you down? Not us that's who! 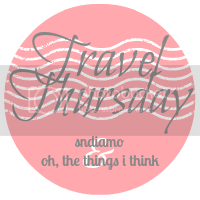 I'm teaming up with Oh, The Things I Think to bring you Travel Thursday. This is a chance to share past travels every (you got it) Thursday. Domestic. International. Anything goes as long as it's travel related. Packing lists, to-do's, reviews, restaurant recommendations, only photos, etc. Knock yourself out. Feel free to grab a button and add your link below! First of all - geology jealousy! Those photos are amazing! Plus, yay another big family holiday. And he's sooooo little! Oh ma gard! I'm having an emotional reaction to this post! I love the Finger Lakes! I love wine tasting! I've stayed at that Ramada! I refuse to believe you gave birth 3 weeks before these pictures were taken. REFUSE. You look great! Aw great pictures! I need to take notes considering my family is going to OBX around my due date...haha. And oh my word, I LOVE Lettys hair shorter like that...look at those bouncing curls! I know you would probably never cut her hair shorter, but I just love how it looks here :) David was such a little peanut. Sniff. I'm so impressed by this post! It gives me so much hope that we might actually be able to leave the house (SHOCKING) after having baby #2! :) Fingers crossed. Amazing photos! You forgot to mention Davids fall out of his stroller!! Ok, seriously, you travel all the time, right? I love that your kiddos get to see so many great things! Seeing little D makes me want to have another...just a little bit. Ok, I'm done. I will just look at your old baby pics to get my fix.